Barry Armer and I were talking about having problems finding inspiration. Barry indicated that when he got a photographer’s block, he would go to Kemah to solve the problem. I like Kemah, but do not always find something that really makes me stand-up and take notice like walking around JD’s garden. There always seems to be something that I find interesting and most of the time they present some technical problem to photograph. Such was the case the other day when I discovered this patch of mushrooms. I liked the color and the texture and that is what I tried to capture. Camera settings: Nikon D3, Nikon 105mm f/2.8 shot at ISO 800, f/22 and 1/30th of a second on a tripod. Lightroom—Set black and white points, increased mid-tone contrast and changed saturation of yellow and orange, sharpened and reduced noise slightly. Like the colors and texture within the pix. I am surprised that at f22 that you have so little DOF. I like your idea but I wish a little more of the photo was in focus, say all of the closest mushroom. Pretty cool pix. Love the details in the mushroom. Colors and texture comes through however I do not think that these two elements are sufficient to carry long term interest in the photo. This one seems to have high initial impact but would fade over time. 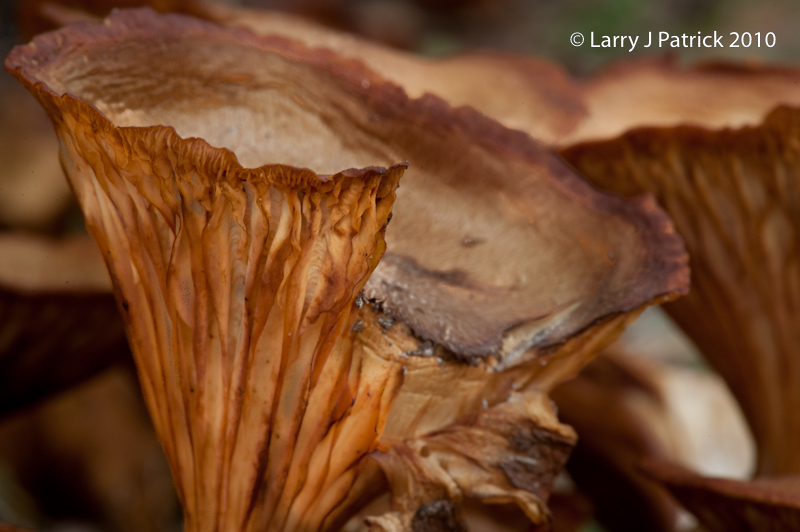 I like the colors and the texture of the main mushroom. I wished that you had done something with the lighting to make the mushroom pop from the background. Great monochromatic colors and blend of textures Larry. Nice shot - JD's garden comes through again!